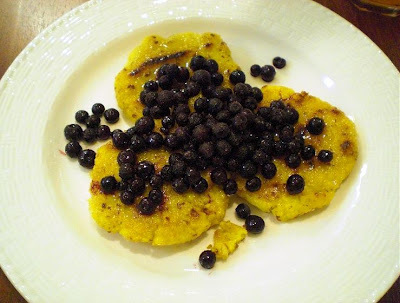 The Homesteading Cottage: Ever Tried Johnnycakes? Yesterday was "clean out the pantry and fridge" day. That lovely time when the odds and ends left over from other creations are used to make interesting concoctions (: A stocked kitchen keeps things prepared for any occasion, but lately my lack of grocery store shopping has created a buy-as-you-go situation. And so it was time for lunch, but nothing really floated my boat. Do you ever have those times when nothing sounds good? So as I glanced over the last few items, flaxseed meal, cornmeal and honey butter jumped out. I could make Johnnycakes! These old fashion golden little discs of crunchy goodness cause my heart to flutter. We didn't eat them in our home, but my Grandmother would make them from time to time. She would tell stories of moments shared with Granddaddy in the kitchen as he taught her to make Johnnycakes and really, everything else. See...Grandmother had no idea how to cook. Granddaddy was the genius in the kitchen and he taught Grandmother everything she knew. We've always been a very nontraditional family and I was having a nontraditional day, so Johnnycakes seemed to be the perfect choice for lunch! Bring water to a boil and add ingredients. Remove from heat and stir until everything is mixed. Let it sit for about 30 minutes until the cornmeal is slightly firm. Scoop out a large spoonful, roll it into a ball and then pat flat and place in a greased pan. I use coconut oil or butter. Cook on medium high until each side is crispy. The cornmeal was cooked during the boiling process so you're just wanting to fry the patties long enough for the crispiness to come forth (: The time will vary depending upon patty size. Once done, plate them up, spread on the honey butter and top with frozen wild blueberries. You wouldn't think so, but the flavor combination of the cornmeal, flaxseeds and blueberries is AWESOME!! If you're not into berries and honey butter, then just drizzle on maple syrup and you're good to go! There are so many things you can do with Johnnycakes. For a savory side, top them with chicken or tuna salad. In the mood for something spicy? Pile on a hot salsa and chili with raw cheese! Yum (: They would even make great mini pizza crusts in a pinch! 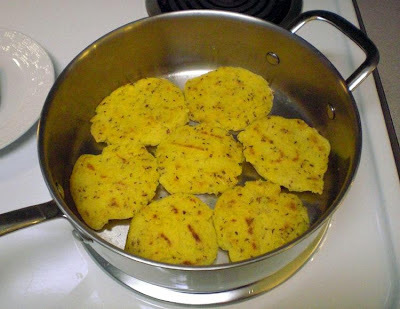 Making Johnnycakes with your children is a great way to get kids involved in the kitchen because the cornmeal has a playdough-like consistency. Let your little ones roll the meal into balls and smash them into patties. I've found when the kids are part of the action, they'll eat whatever they make...even veggies! !